By reading this series, you will be given the answers how the naughty​ boy of South Japan's countryside became Shintake, internationally recognaized physicist who developed the Nanometer Spot Size Monitor at FFTB SLAC (Shintake Monitor) and other distinguished projects in the X-ray laser field, and why and how he is focusing on the research and development of electric power generation using ocean wave and current along with the development of a super hightech quantum wave microscope. 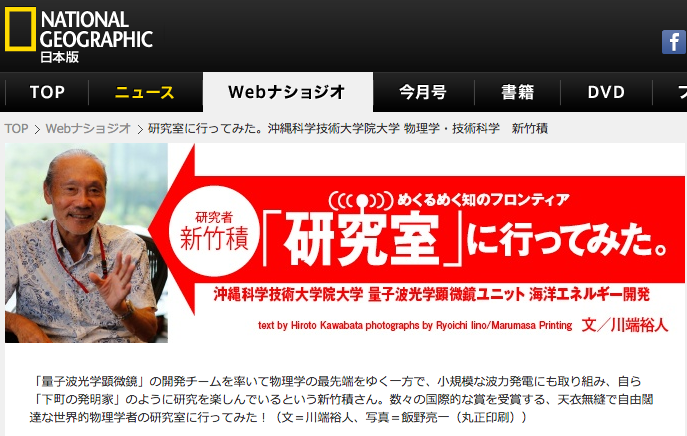 The above National Geographic Japan's column featureing Prof. Shintake is now accessible from Nikkei Business Online, Japan's very popular business oriented website. The series of five interviews will be uploaded weekly on Saturdays. It explaines very well his unit's different projects.